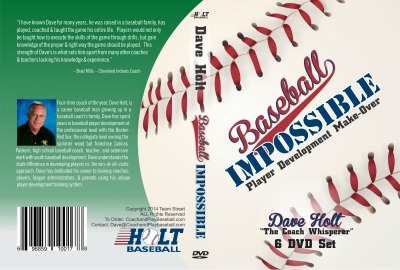 Coaching Youth Baseball DVD: 6 video set Now you're a baseball coach, Now What? 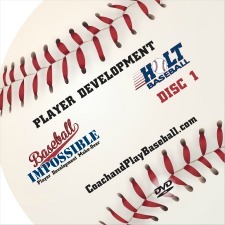 Coaching youth baseball DVD is now available. I have added three more awesome dvd's to the original baseball coaches videos release to make a 6 DVD set for baseball coaching. What Will I Know After Watching the Six Videos? Know the Difference between the win-at-all-costs approaching and the player development approach. How to Build a baseball practice where players never want to go home. Understand Why players drop out. How to build a local minor league player development system. Be able to successfully work with parents, umpires and players to create a communicative cooperative environment. Build a team culture that builds teamwork, character and respect for the game. Know how to run and manage the ball games like a pro. Create a local player development system that feeds into your local high school baseball teams. Do's and Dont's for youth baseball coaches. Know why you coach and what approach is best for kids. See that there is something much bigger than baseball here that you have a say about. Why is Player Development Important? Over 6 hours of video to watch on six different DVD's. Build your coaching baseball library resources and review at your leisure. This is better than coaches certification courses. There is more tips and techniques and 'tricks of the trade' in this video series than anywhere else on the market. 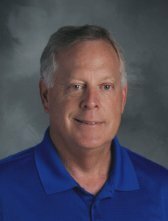 No one really talks about a coaching approach, or coaching style. This is unique information not talked about in the market today. The need for the right kind of coaching approach is apparent in baseball today. 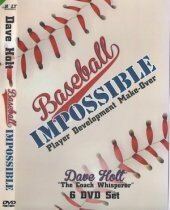 Rarely if ever do baseball coaches get any kind of training to help them develop a player minded coaching approach. 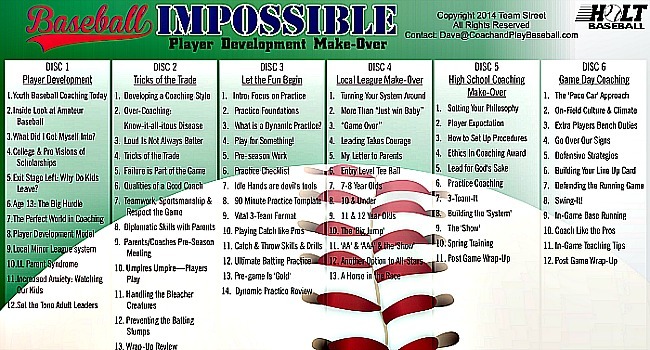 Make your youth baseball team player development minded. Learn how to measure success on more than winning and losing. You are sitting side by side of a professional baseball coach. Learn how professional baseball coaches handle players. I wish every youth baseball coach and high school coach could sit in the dugout during a professional game. I think you would be blown away. Professional coaches know what to say and when to say it. Do you know the difference in game coaching and practice coaching? Are you a positive coach or negative. Do know how hard baseball is to Play? Do It Yourself…Or Go With Experts in the Field? If I want to look up some medical knowledge on some symptoms I seem to have I usually look on the internet and do some of my own research. This is pretty common and nothing wrong with getting more information on a condition. Many baseball coaches do a lot of internet surfing and looking at quick practice drills or strategies and baseball related sites. This sometimes helps if you get a quality link with professional knowledgeable baseball people. But, if I get really sick or need a speciality treatment I want a real medical professional. I want an expert in the field. I want the best doctor in town or in the region. I want someone who sees this condition everyday and has a track record. That is what I provide here in these six DVD videos. An expert in the field. This is a proven system of player development. 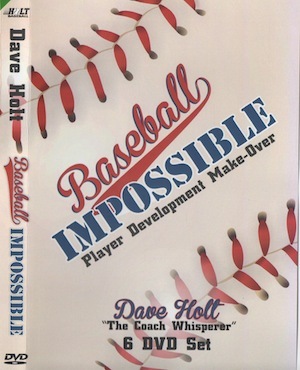 I am a player development coach with years of knowledge and experience to help you be more competent in the field of youth baseball coaching. How will you benefit? By knowing how to promote and implement a player development system in your coaching style. There is no other material like this available today. The fact is this material on 6 DVD's is not available any where else. If you want to go it alone and have baseball parents down your throat all season and chaos in your dugout then you are welcome to try it. No one goes into the season wanting 12 kids and their parents irate at you and looking to play soccer next season. Do you want to try the first 3 DVD's only? Click the 'How to Coach Baseball' thumbnail link below.